Ideal for taller users or anyone who prefers a longer axe, Fiskars much-requested X27 Splitting Axe provides power that makes splitting medium-sized to extra-large logs easier than ever. Like every X-Series Hatchet or Axe, the X27 combines perfected weight distribution, advanced blade geometry, an ultra-sharp edge and virtually unbreakable design to maximize your performance. This combination of features allows the blade to disperse wood more effectively, offering more one-strike splits with each swing. It also includes Fiskars longest handle for increased leverage to maximize the power and speed of taller users. Since you can split wood more easily with the X27, each job requires less time, less effort and less hand strain. Make every swing your best with an axe designed for extreme performance. Unlike traditional axes that can be heavy, quick to dull and easy to break, X-Series axes combine perfected weight distribution, advanced blade geometry, an ultra-sharp edge and virtually unbreakable design to maximize your performance. 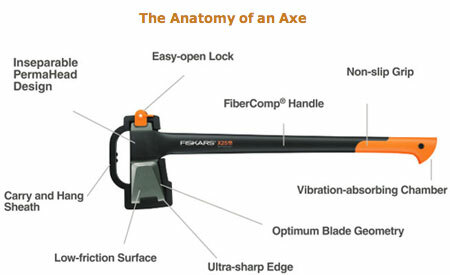 Note: Image shown is of the Fiskars X25 Splitting Axe. Proudly made in Finland, the axes are designed to be simple, functional and effective, helping you get more work done in less time. This design earned the X-Series axes the international red dot “best of the best” product design award for the garden category in 2010, recognizing outstanding design quality and trendsetters. A wide range of sizes and styles makes it easy to find the X-Series axe perfect for you, whether you’re chopping kindling, chopping logs, splitting logs or felling trees. X-Series axes combine innovative features for chopping axes that chop 3X deeper and splitting axes that offer more one-strike splits. All X-Series axes feature a smart design that distributes the majority of the weight to the axe head while keeping the stronger-than-steel FiberComp handle lightweight. This perfected weight distribution provides an optimal power-to-weight ratio that increases swing speed to multiply power, much like an aluminum baseball bat. X-Series axes give you more power at impact to help you get more done with every swing. The blades of X-Series axes are crafted with a proprietary grinding technique that provides a sharper edge for better contact and cleaner cuts. The hardened, forged steel blades also stay sharp longer than traditional axes, and a low-friction blade coating helps power through the tough logs and prevents the axe head from getting stuck. X-Series Splitting Axes also include advanced bevel convex blade geometry that adds even more power and disperses wood from the blade for cleaner, one-strike splits. X-Series axes don’t just outlast other axes–they’re virtually impossible to break. A shock-absorbing FiberComp handle is lightweight yet stronger than steel, so it can’t be broken through overstrike. The hardened, forged steel blade won’t chip or crack, and the innovative PermaHead design is over-molded so the blade can’t be separated from the handle. Note: Images shown are of the Fiskars X25 or X27 Splitting Axe. This entry was posted in Gardening Equipment and tagged 36Inch, Fiskars, Splitting, Super by Lawn Advice. Bookmark the permalink.